Caia Crafts is a community enterprise producing high quality, hand crafted wooden products. The enterprise grew out of a woodwork shop providing training to people, many of whom had poor health, physical or learning disabilities or were unemployed. The aim of establishing Caia Crafts was to provide a sustainable, financially self-supporting project that ensured the continuation of the woodwork shop into the future and secured a valuable resource for the local community. Any profit made by Caia Crafts is reinvested in the woodwork shop and other projects that benefit Caia Park and Wrexham as a whole. Caia Crafts has one full time member of staff but its workforce is made up of volunteers and participants on schemes to help them back into employment. Through their involvement in Caia Crafts volunteers and trainees learn woodworking skills and gain valuable practical experience not only of wood manufacture but also of sales and marketing. All of our products are manufactured from Welsh timber from accredited sustainable sources or 100% recycled wood. Much of the wood we use would otherwise have been sent to landfill. Caia Crafts promotes environmental responsibility and plays a small part in the flourishing wood crafts industry in Wales. Our hand crafted gifts range are produced using Welsh timber from accredited sustainable sources or 100% recycled wood. 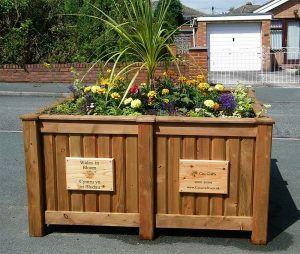 Planters for Gardens and Public Spaces. If required you can also have your planters lined, treated and add a plaque with your own logo. Caia Crafts can undertake commission for custom made products to meet your specific requirements! Recent examples include an Oak memorial bench and a picnic site. By purchasing from Caia Crafts you are not only receiving high quality products you are also helping towards a local charity. If you would like further information or to request a free quote, our staff are happy to help!